Lots of cities are switching to LED streetlamps to save energy and money, but if cities are going to pay the cost to replace those lights, why not go all the way off the grid? 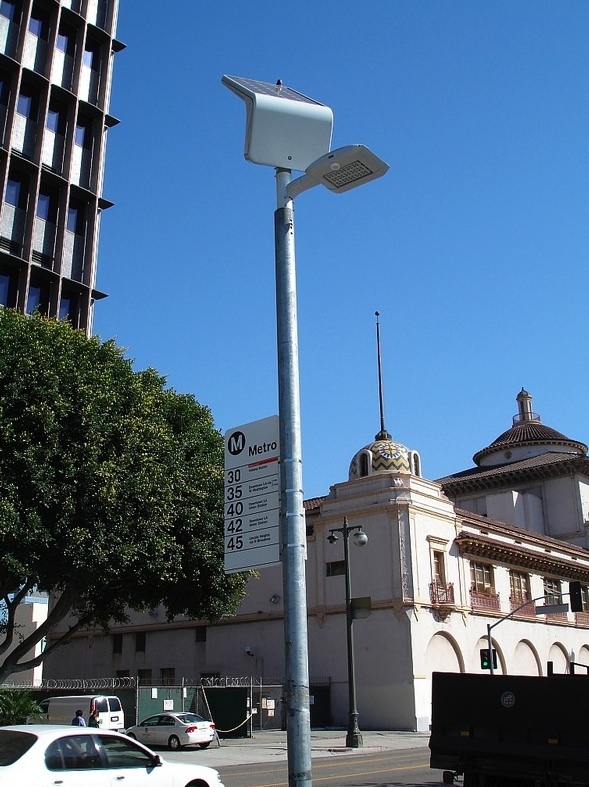 Lighting manufacturer Carmanah has partnered with a team at frog design to create a series of solar LED streetlamps that are cost-efficient, environmentally savvy, and smart enough to power down when no one’s around. The lights, which hit the market in May, have just begun to pop up on the streets of sunny downtown Los Angeles. The Carmanah 1710 series uses ultra-thin monocrystalline solar panels–the most efficient on the market–which can be manually tilted when installed to take the best advantage of the sun’s angle. The LED bulbs last much longer than traditional streetlamp bulbs, and the battery and components can be recycled. Cost savings for cities using the LEDs are significant, since crews won’t have to spend the money trenching, cabling, and accessing the power grid, and then of course there won’t be any addition to the monthly energy bill. The lights can be placed atop existing poles or mounted on super-lightweight stands, as they don’t need to be weighted down with wires or hardware. And as this video illustrates, they can be installed in just 30 minutes.